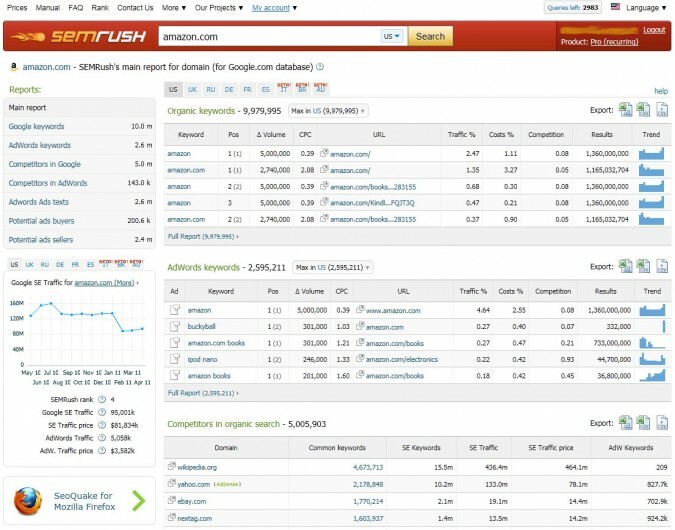 SEM Rush (semrush.com), a new SEO tool for keyword and AdWords research was announced recently by the team responsible for SeoDigger and SEO Quake FireFox plugin. SEMRush is a new product for advanced SEO and keyword research developed as a result of the many comments and suggestions received regarding the successful SeoDigger tool. SEMRush uses 25 million of the most popular and expensive keywords to collect Google search results. SEMRush can show you keywords for any domain ranked high enough to be in top 20 search results results or that purchases AdWords. The tool is based on the US version of Google.com. Read Clickfire’s interview with Gleb Suvorov, part of the powerhouse behind SEMRush. SEMRush is an intriguing online tool for taking a look at a domains position in search, in both the paid and organic arenas. It can be used to give a webmaster a little extra insight into his own website or his competitors. But, just like any other tool that costs money, it is hard not to question whether or not it is worth it. And, just like any good SEMRush review should, that is exactly what this review will be looking at. This review will follow this format: each type of report offered will have a description of what it can do and how useful it can be. Additionally, each type will use the information pulled for a domain that very few have not heard of: amazon.com. Near the end of the review, a couple of benefits and limitations that apply to all of the reporting will be looked at before the end of the review gives an overall opinion of the tool. First comes Organic Keywords Reporting. Note: This is using the Pro (Recurring) subscription priced right around $50 per month. The organic keywords reporting offers insight largely to the SEO crowd. It reports how many keywords the domain is ranking for, which keywords the domain is ranking for, and exactly what rank those keywords are at, or at least what they were at when SEMRush last found them. In addition to this, it reports the average monthly volume, the expected CPC (cost per click), an estimate of what percentage of total organic traffic this keyword brings in, an estimate of what percentage of the cost of that keyword would be if all of the organic traffic was paid traffic instead, a competition rating, the number of results that shows up when this keyword is searched, a per-month trend graph, and the exact URL on this domain that SEMRush last saw listed in the SERPs (search engine results pages). As an extra bonus, when SEMRush has it, they will also report on the previous position of the keyword. This is one of the most detailed reports that SEMRush has to offer. It is usually reasonably accurate once it has found a domain often enough in the SERPs to include it in their database. This is useful for getting quick, large scale estimates of how a domain is doing in organic search, but it’s hard not to notice something; while SEMRush reports practically 10 million keywords, when you export the data to take a good look at it, less than 7,000 of them are actually exported. The AdWords keywords report dives head first into what matters when a webmaster is talking about paid search and SEM: the keywords that the ads are targeting. The information shown here is very similar to the organic keyword reports, except that everything is applied to paid search instead. Specifically, this report offers the keyword, the paid position of that keyword (and sometimes the previous position), the estimated monthly search volume, the estimated CPC, the displayed URL, the estimated traffic percentage, the estimated cost percentage, a competition rating, the number of results returned, and the trend patterns. Online only, the report also includes a link to show the exact ad being used. In the export only, the actual URL that the ad points to is shown. This can be very useful for determining what a main competitor is targeting for keywords. What this doesn’t show is how successful that competitor is at targeting those keywords, beyond the positioning. A webmaster will have to use his own tracking to determine what keywords are worth the spend. The organic search competitors report is based on similarities in keywords ranking. It mainly looks at the number of common ranking keywords. It also considers how many keywords that domain has in the top 20 results, as well as the estimated traffic coming from those keywords and the would be cost of this traffic if it was from paid. Lastly, it looks at the number of paid search results the competitor has in the top 20 paid results. The problem with this report is it tends to be far too broad. For example, Amazon’s main competitor is listed as Wikipedia, which also shows up at #4 for ClickFire’s top competitors. Due to the extreme size and scope of Wikipedia, most domains have it listed as one of the top 5 competitors. However, this report isn’t entirely off base. eBay is listed as one of Amazon’s top 5 competitors, which would be hard to disagree with. This report mirrors the organic search competitors. It looks at common paid keywords, AdWords keywords in the top 20, AdWords traffic from those keywords, the price of those keywords, and lastly the number of organic keywords in the top 20. Because these keywords are targeted by the domains by choice, this report tends to be much more accurate. Amazon’s biggest competitor here is a website called buycheapr.com, which targets a wide variety of products. Numbers 2 through 5 are nextag.com, bizrate.com, best-price.com, and shopzilla.com, all of which make reasonable sense. This report is simply a list of known unique ads that are running. Nothing more, nothing less. It doesn’t even report on the total number of unique ads it found, limiting the immediate usefulness of this report. However, if a competing webmaster would like to see thousands of examples of how a competitor is attempting to target, this report has it. It’s just a shame that you don’t know what percentage of the existing unique ads are exporting properly. This report is surprisingly similar to the competitors in AdWords report. It just swaps out the main sorting factor from AdWords keywords to organic keywords and requires that the number of AdWords keywords in the top 20 exceed the number of common organic keywords. The idea here is that a domain is naturally targeting the same words, but spends more effort on paid traffic, they might be interested in advertising on a domain that has similar organic keywords. This is the inverse of the potential traffic buyers report. SEMRush does its best to provide this information across a total of 9 different countries: USA, UK, Russia, Germany, France, Spain, Italy, Brazil, and Australia, though the last 3 are currently in beta. It usually does have information across all the countries, but the USA tab almost always has exponentially more than the other tabs. That doesn’t make the information from the other countries useless, but it is still a limiting factor. It’s hard to miss a trend across each of these reports; the number of results exported is much lower than the reported number of results. This is partially due to the fact that the Pro subscription is limited to exporting 10,000 results, but why are some of the reports lower than 10,000? This is unclear, but if you need more information than the top 10,000 results for each domain, you might want to consider a higher level subscription which will allow more results to be exported. But, if you ever need more than 100,000 results, which is the limit for the most expensive monthly package, priced at $499 per month, you’ll need to order and pay extra for a custom report. Through these custom reports, all of the results can be exported; even all 10 million organic search terms. Another issue is lag time between actual results and when SEMRush sees them. The worst offender here is the organic results. It can take nearly 2 months for a new website to begin appearing in SEMRush after it starts ranking for terms. Unless the domain is very large, the organic information is commonly around 1 month outdated. This doesn’t make the data useless if it is understood that the information is an estimate, but it certainly couldn’t be used for reporting. If a blogger or search marketer thinks himself serious about keeping an eye on competitors so that counter-strategies can be formed and executed, it’s hard to beat SEMRush. For a beginner, the Pro price can be hard to handle, but once a enough income is being earned to pay for this tool, it tends to be worth it. However, if you specifically want to see how a competitor is doing well in organic search, check out our SEO SpyGlass review. If you want to see how exactly a competitor is doing well in paid search, you may want to read some guides about quality ratings, but beyond that, it is often just about bidding more for the most valuable terms. One of the most prominent seo services. Interesting to watch as it grows with us and delivers more clever results every week. i wish that the company would include an about page so we can be better informed. might seem like a small thing but it would be nice to know who is behind the curtain at semrush.com. Really a great tool for keyword & competition analysis.. This service is worth every dollar. You can find top 200 organic Keywords for that domain and backlink report which gives the detail backlink report for any domain along with anchor text. Yes, the SEMrush Keyword Tool is super to the Google Keyword Planner tool. Thank you so much to explain the key features of the SemRush SEM tool. I think I need to buy to improve my website traffic and profit as well. iSpionage.com is another great PPC and SEO competitor tool that offers landing page screenshots which no other competitive intelligence tool provides at the moment.